This article or section requires a cleanup in order to meet the 2007scape Wiki's quality standards. You can this page to improve it. Herblore training can only begin after completing the Druidic Ritual quest. Methods of training Herblore range from cleaning herbs to making potions. To make a potion, one will have to gather the required ingredients and use them on a vial of water. A great way to maximize your Herblore experience per potion is to have a good supply of either caviar or roe in your bank. Always make sure you have at least 100 vials in your bank. After Druidic Ritual quest, the player will gain 250 Herblore experience and will be level 3. Players are recommended to complete Jungle Potion quest for a 775 experience reward, raising their Herblore level to 9. Make attack potions the ingredients for which are a vial of water, a Guam leaf and an eye of newt. They give 25 experience per potion. The player is required to make 87 attack potions to reach level 15 if Jungle Potion has not been completed. If the player has completed Jungle Potion, they are only required to make 55 attack potions. Use the eye of newt with the unfinished potion to make an attack potion. Although after level 5 there are better ways to train Herblore, making attack potions is a good way to dispose of unneeded Guam Leaves while gaining some Herblore experience. The secondary ingredient, eye of newt, can be bought from Jatix's Herblore Shop in Taverley or from Betty's Magic Emporium in Port Sarim. This method is one of the cheapest ways of reaching level 15. It is possible to farm your own guam at level 9 Farming. After reaching level 15, a fairly cheap route is to start the quest Shades of Mort'ton up to the point where you learn the Serum 207 recipe. Serum 207 requires Tarromin and Ashes to create. They give 50 experience per potion. Tarromin and ashes are both relatively cheap to purchase on the Grand Exchange. It is possible to farm your own tarromin at level 19 Farming. This method is incredibly click intensive, as there is no "Make All" option when making Serum 207, and so each potion will have to be made individually. Strength potions require tarromin and limpwurt root to create. They give 50 experience per potion. It will take 127 Strength potions to reach level 26. Limpwurt root is quite expensive. However, it is possible to grow your own at level 26 Farming. At level 26, players are able to create energy potions . At 31 a player may like to do the quest Eadgar's ruse granting 11, 000 experience. To create an energy potion you need harralander and chocolate dust. Energy potions give 67.5 experience per potion. Level 26-38 requires 21, 668 experience. It will take 322 energy potions to reach level 38. Chocolate dust is relatively cheap when bought on the Grand Exchange and it may also be acquired from Grand Tree Groceries for a lower cost. To create a Prayer potion, you need ranarr weed and snape grass. Prayer potions give 87.5 experience per potion. Combat potions are a cheap alternative to the prayer potion method often requiring less than 600 gp for the materials and selling for less of a loss than prayer potions on average and sell relatively quickly To create a combat potion, you need harralander and goat horn dust. Combat potions give 84 experience per potion. 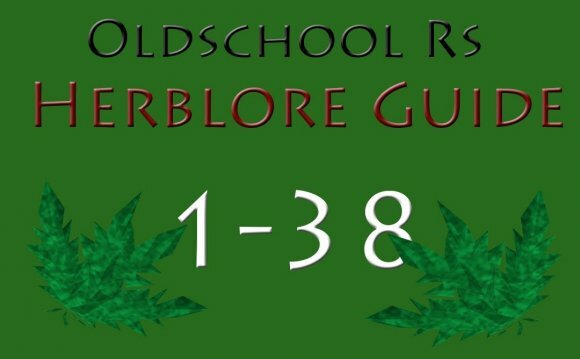 Level 36-55 Herblore requires 141, 821 experience. 141, 821 / 84 = 1688.3 = 1689 combat potions to reach level 55. Goat horns are significantly cheaper before they are ground into dust. Consider buying the horns intact and grinding them yourself to save money. To create a super strength potion, you need kwuarm and limpwurt root. Super strength potions give 125 experience per potion. Level 55-69 requires 501, 415 experience. 4012 super strength potions are required to reach level 69. The ingredients are fairly easy to obtain from other players, but the loss per potion can range from 500 gp to breaking even. Kwuarm can be grown with level 56 Farming. Limpwurt root can be grown at level 26 Farming. Antifire potions become available at level 69 Herblore. To create an antifire potion, you need lantadyme and dragon scale dust. Antifire potions give 157.5 experience per potion. Level 69-81 requires 1, 524, 767 experience. Level 69-72 requires 231, 206 experience. Level 69-99 requires 12, 366, 380 experience. 78, 517 antifire potions are required for level 99. The cost to produce these potions is considerably less than super strength, as lantadyme can usually be obtained for 700-1.5k, and the secondary ingredient, dragon scale dust, is ~300-500gp. There isn't much profit (if any) to be made, but these are the fastest and cheapest potions to make from a raw cost/xp perspective. To create a ranging potion, you need dwarf weed and wine of Zamorak. Level 72-81 requires 1, 293, 561 experience. Level 72-99 requires 12, 135, 174 experience. 74, 678 ranging potions are required to reach level 99. The loss is about the same per potion as super strengths, unless you decide to camp the spawn spot for its secondary ingredient: wine of Zamorak. Ranging potions only offer 5 experience more than antifire potions. While the raw materials cost approximately twice as much, they do sell for more than anti-fire potions proportionate to the cost of materials. To create a Saradomin brew, you need toadflax and crushed nests . Level 81-99 requires 10, 841, 613 experience. 60, 232 Saradomin brews are required to reach level 99. Can be profitable if materials are gathered correctly. To create a super combat potion, you need torstol, super strength (4), super defence (4) and super attack (4). Most of the time this is profitable. However, prices change daily.